I grew up with very limited exposure to flavor profiles outside of Italian food and “American” food, e.g. burgers and hot dogs. I was very interested in learning more, but we didn’t eat out much and I didn’t have too many resources for recipes. We had a lot of variety in pasta shapes and diversity in pasta sauces though! I don’t know when I was exposed to Persian food, but I think it was well after I had moved to LA in my early 20’s. It quickly became one of my favorite cuisines. I just love the herbs, spices, the color and beauty of the dishes. And I am crazy for rice! Once, a Persian friend invited us over for dinner and she made at least two rice dishes, but with enough for 4 times as many people and so, so delicious. I’ve always wanted someone to teach me how to make Persian food, and finally my prayers were answered. My lovely friend, Naz Deravian, wrote a beautiful book of Persian recipes and stories called “Bottom of the Pot.” It tells the story of her journey from Iran to Italy and Canada, and brings to life the tastes and warmth of Persian cuisine. I was absolutely captivated by Naz’s stories as much as her inviting recipes. I am looking forward to making many of these dishes. I don’t have any other Persian cookbooks and I can tell from her writing style and unfussy approach to cooking that Bottom of the Pot is my kind of book. I honestly couldn’t decide what to make first and I actually surprised myself for not picking a rice dish. 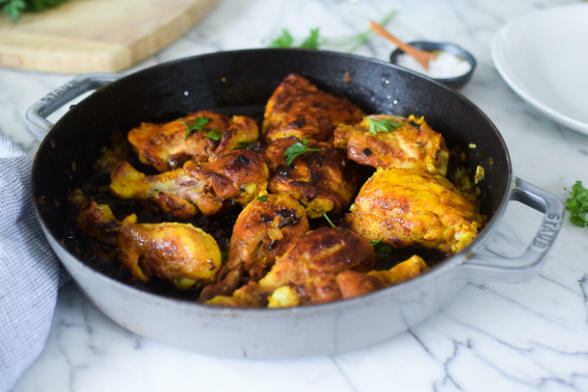 But I had just posted a Middle Eastern rice and lentil recipe two weeks ago, so in the interest of recipe diversity on the website, I was intrigued by this Everyday Turmeric Chicken recipe. I don’t even like chicken that much, but there I was, eating my second piece and licking my fingers. Wow! This was simple, tasty (a little tart and pungent), and relatively quick. I served it with rice and some sautéed vegetables. 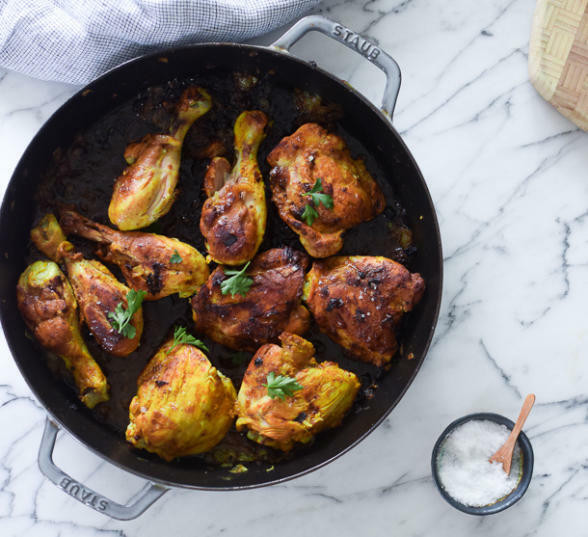 Perfect weeknight dinner or perfect dinner for guests (although I don’t love the idea of guests + turmeric, just saying.) Naz recommends 10 drumsticks, but I prefer thighs so I opted for half thighs and half drumsticks, asking the butcher to remove the skin for me. I also used a 14-inch skillet, although Naz recommends a 12 -inch skillet. I’m going to follow her advice next time so I have a little more sauce at the end. I thought I needed the larger pan because the thighs took up more room than drumsticks. This was also great the next day shredded and turned into a turmeric chicken fried rice. If you don’t eat chicken, I think you could make this delicious with cauliflower steaks. And there are plenty of vegetarian and vegan recipes in the book. The above images are mine and the one below is from her book. I’m no food stylist, so I wanted to make sure the recipe had fair representation! If you love Persian food, I am sure you will love this book. It is so much more than a cookbook, it’s also a trip to Iran and an education in Persian cuisine. Well done, Naz! I love seeing your creations, so please tag me on Instagram @pamelasalzman #pamelasalzman so I can check them out! My new online class for October is coming out this weekend! The new recipes are great, but my classes are so much more than that. I discuss technique, best practices, nutrition, favorite products, adapting for different diets and so much more. Here’s a link for more information. Make a couple of slits in the flesh of each drumstick. 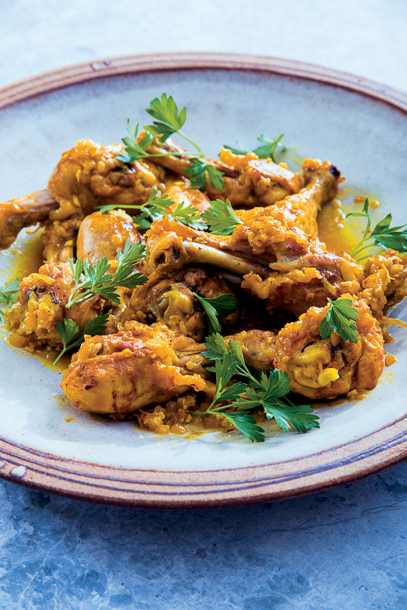 Place drumsticks and thighs in a large bowl and season with turmeric, salt and pepper. Mix together until well coated. Set aside. Warm the oil in a large 12-inch pan over medium heat. Add the onion and a pinch of salt and sauté until tender and translucent, about 8 minutes. Add the garlic and cook for 2 minutes. Add white wine, if using. Add the chicken to the pan and cook for about 3 minutes on each side. Add the lemon juice and ¼ cup of hot water. Turn the chicken in the sauce to coat all sides and scrape all the crispy bits with a wooden spoon. Reduce the heat to medium-low, partially cover, and simmer, turning occasionally until the chicken is cooked through, about 35 minutes. Could you do this recipe with chicken breasts instead of thighs/drumsticks? If so, would you need to alter any of the cooking times/method? Hi there! Naz here from Bottom of the Pot. Yes, you could absolutely make this dish using chicken breasts. 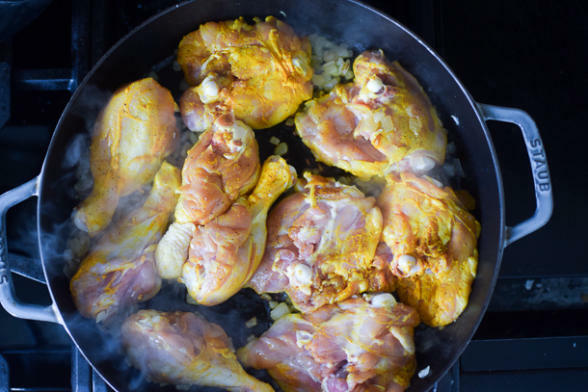 Reduce the cooking time if using boneless chicken breast and maybe add a little more water to make more juice, since chicken breasts are more dry than drumsticks and thighs. This recipe is very flexible, I prepare fish this way as well, or as Pamela suggests cauliflower would be great as well. Hope you enjoy! I just made this, it’s delicious and easy. I should have served over rice or sauteed vegetables as suggested by Pamela. I used fresh tumeric becasue I had some, instead of ground. Is there a reason you didn’t use fresh tumeric? It’s not my recipe. It’s from my friend Naz’s book, Bottom of the Pot. I’m going to assume most people have ground turmeric lying around, but not fresh which might be hard to find in many parts of the country. Just a guess! Hi there! Naz here from Bottom of the Pot. Yes, it’s excatly as Pamela said. 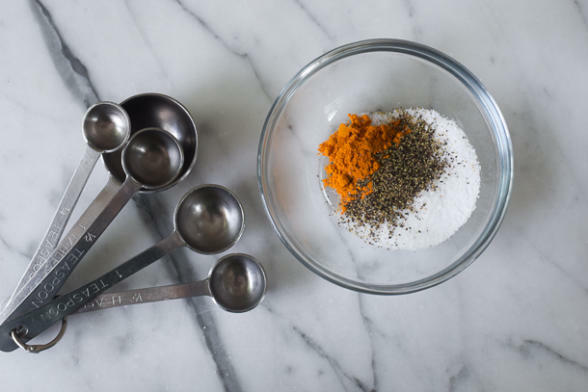 I always have ground turmeric on hand as it’s a staple in our spice cabinet. Fresh turmeric, although lovely, is not as easily accessible everywhere and at all times. But if you have fresh turmeric available please feel free to use it instead! Sooo good and easy! Thank you for yet another winner! Hi there, Naz here from Bottom of the Pot. So happy you enjoyed this! It’s one of our favorites! I made this last night and Oh was it so good. Thank you for sharing. The chicken browned really nice without sticking perhaps because the onions were in the pan and added moisture. I usually have an issue browning chicken. Maybe not having skin made this step easier too. Anyway, we (kids too) enjoyed this very much. I may try 2 tsp of salt next time rather than 2 1/2 or maybe not add salt to my onions. Hi there! Naz here from Bottom of the Pot. So happy to hear you enjoyed this. It’s our go-to meal on a busy weeknight. The salt amount is really to taste, so please feel free to adjust to your liking. The salt amounts in my book are for kosher salt which is less salty (by measure) than sea salt or table salt. Thanks so much for sharing one of our favorites, Pamela! And for all you lovely words regarding my book. You are truly the best! Thank you for posting the recipe, it looks very easy, not much ingredients, I’ll let you know how it went!